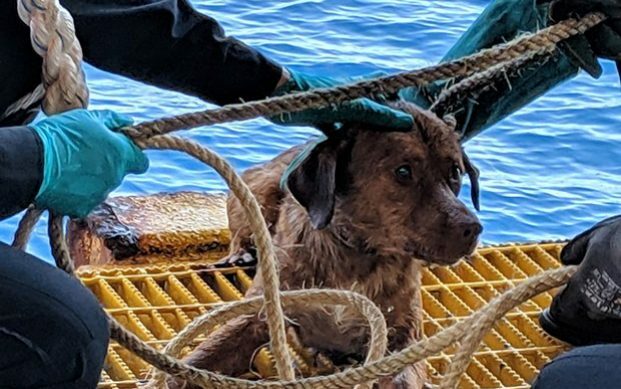 An exhausted dog has been rescued by oil rig workers after it became stranded in the sea some 135 miles off the coast of Thailand. The shivering brown aspen was spotted paddling near a drilling platform in the Gulf of Thailand and managed to swim towards the workers when they called out to him last Friday afternoon. On Monday the dog, named Boonrod, which roughly translates as “survivor”, finally arrived back on land and was greeted by Watchdog Thailand, an animal rights group, and veterinarians. Watchdog Thailand posted pictures of the rescued pooch on its Facebook page, calling him a “beautiful life rescued from the gulf of Thailand” and “inspiration” for 2019.